I managed to catch that mutant virus that was being passed around and therefore missed almost the entire month of October. The virus came back to haunt me quite a bit through the month of November, but I did what I could to grind it out. 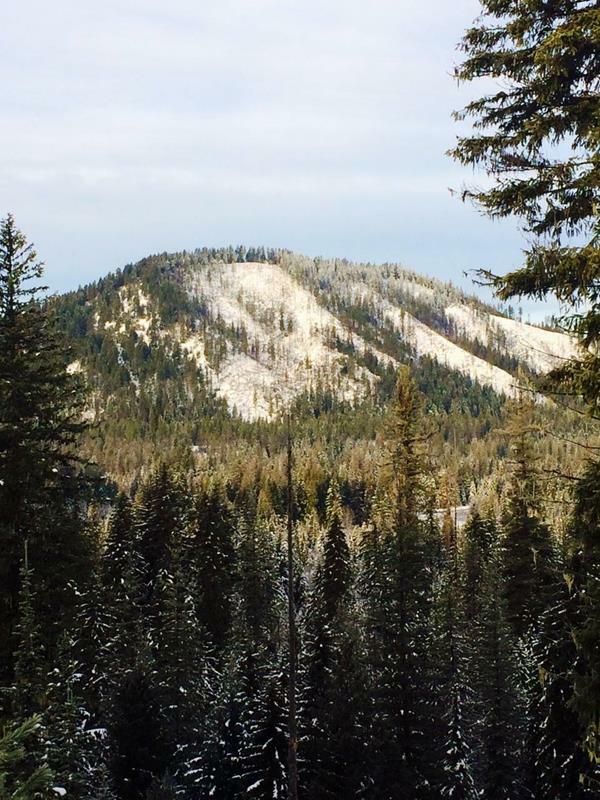 December arrived and I had visions of last minute success in the snow…but it just wasn’t meant to be. 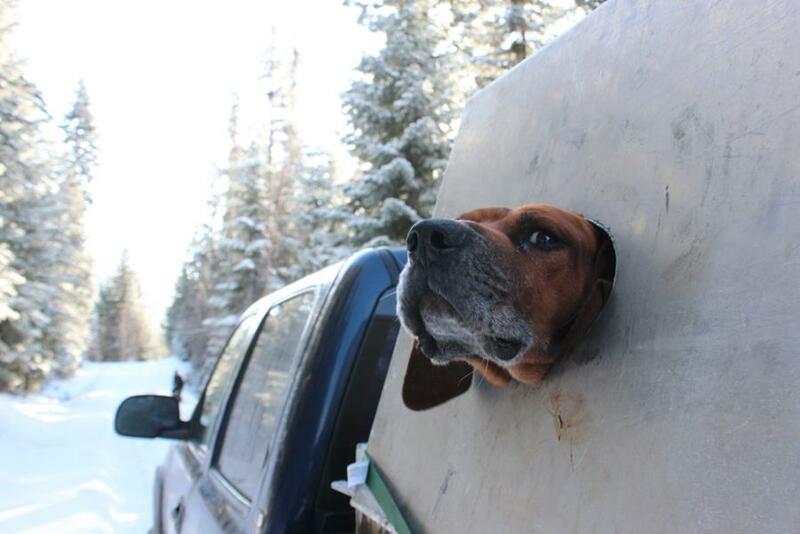 Before long, we pulled up along side of his rig and the beautiful sound of hounds on a hot track reached our ears. This was only the second time that I had been fortunate enough to take part in a hunt of this sort, the first time being uneventful…so I really had no idea how it would play out. Learning that I was the only one holding a Lion tag added a new element to the excitement that was welling inside of me. 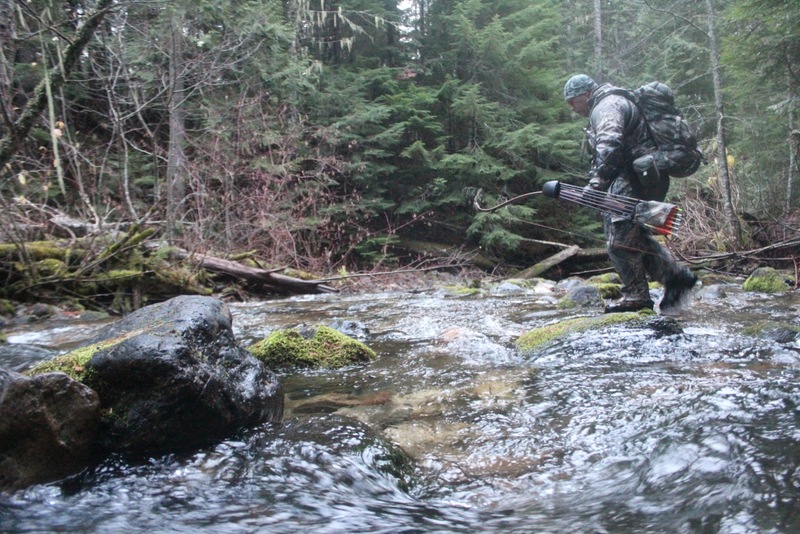 This would turn out to be one of the most unforgettable and physically demanding hunts of my life. It became apparent as the hours ticked by, that we had a very wise and sly cat on our hands. The cat refused to tree and took the dogs on a chase that lasted from early morning until a couple hours before dark. He finally treed around 2:30 and we were locked in and had quite a climb ahead of us. The razorback ridge face jutted up some 1300′ ft. almost straight up from the logging road that we ended up parking our trucks on. It gave you a crook in your neck just look up towards the crest. We took only the necessities and headed up the snow-covered slope. After an hour of “one step forward-two steps back”, I wearily climbed up over the edge of the ridge and stood upon even ground. I finally could hear the dogs again, and before long, we were within reach. 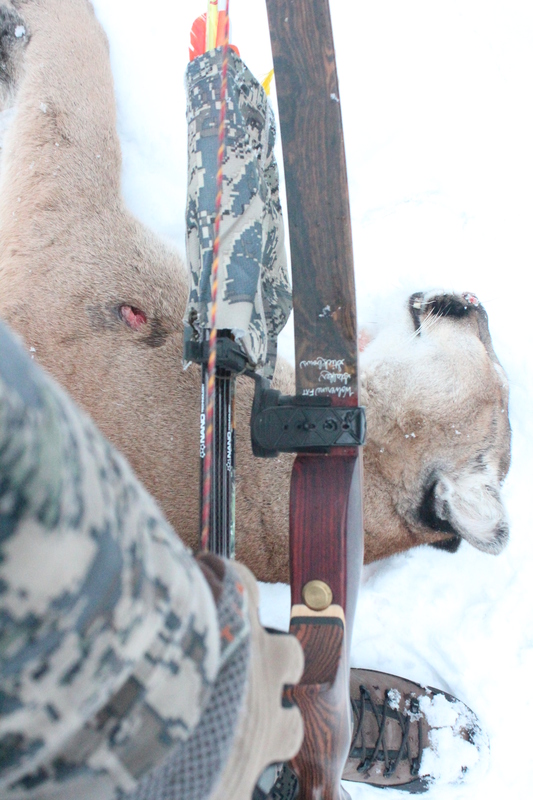 With both quads in full cramp, I got my first up close and personal look at a Mountain Lion. He was much larger than I had anticipated and was very intimidating as he glared down through the branches at us. It looked to be a very challenging shot and with muscle cramps and exhaustion taking over, I thought I’d have to use my pistol. My partners quickly convinced me otherwise, and that we had a very special cat on our hands and I HAD to use my bow. Picking a spot through a wicker basket of branches. Before long I had a shot window picked out and took several minutes to study the small hole in the moss covered-wicker basket that would give me the only path to his vitals. Despite the adrenalin that was surging though my body, I felt calm. The cat was getting nervous and it was time to finish what we had started hours and miles earlier. 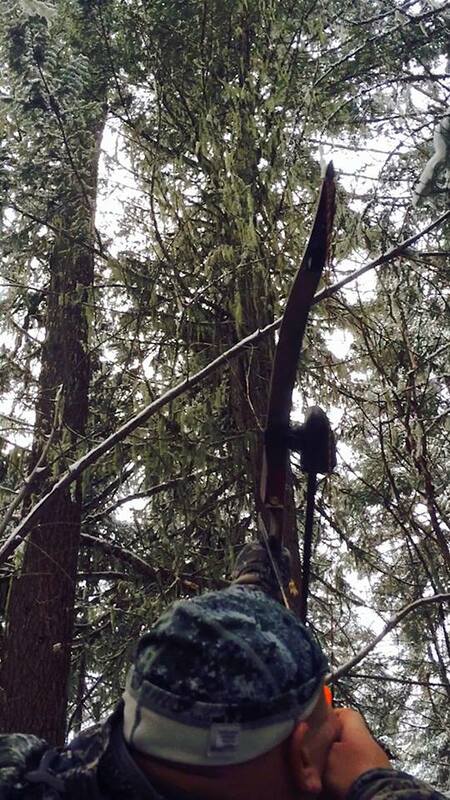 I set my feet, said a quick prayer and then drew my recurve. Before I knew it, the string was slipping through my fingers. I knew that it was all over as the arrow made impact. I only noticed subconsciously as he crashed to the ground, made a lunge down the mountain and then disappeared into a spray of snow. It seemed an entire season’s angst released its hold at that very instant. There was still a lot of work ahead and the trip off the mountain was to be dark and treacherous…but I floated down on cloud nine. I was in complete awe of this magnificent creature. 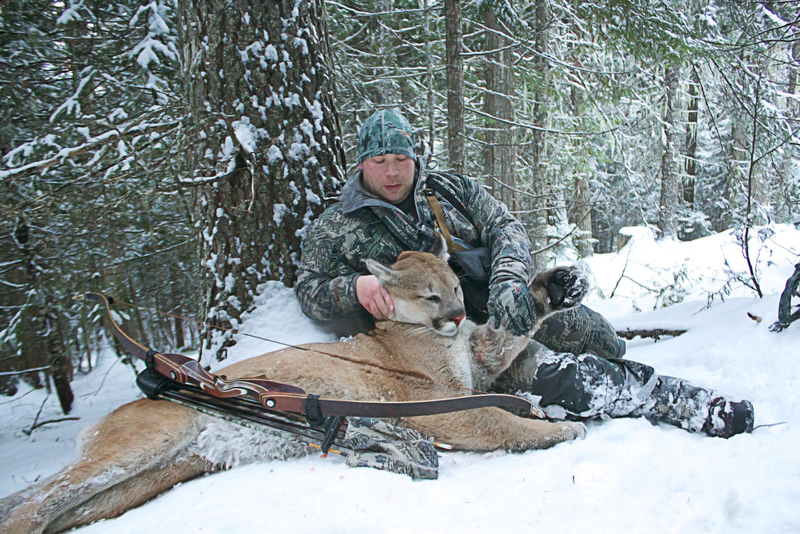 When I said that this was one of the “most unforgettable hunts”, I should mention that not only is this my very first Mountain Lion, but it is also my very first big game kill with a traditional bow. This is an achievement that has been a long time coming and something that at times, felt insurmountable. Every part of this beautiful animal intrigues me. 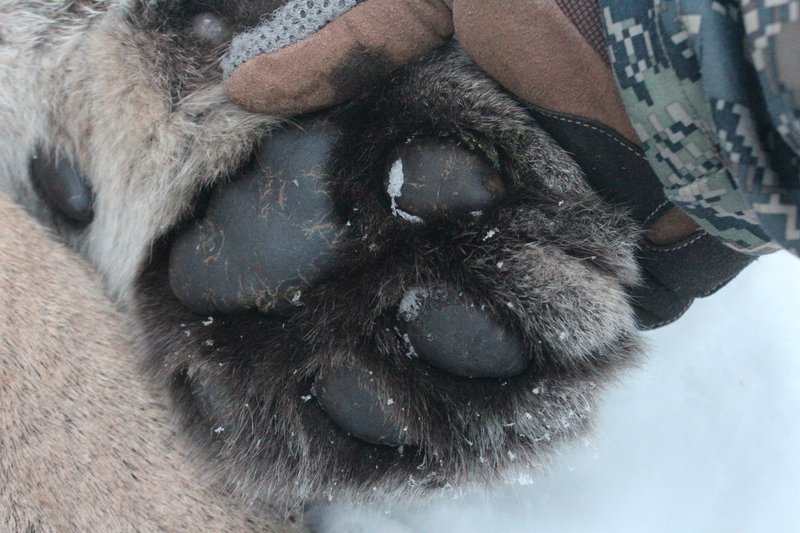 These large paws helped carry the 150# Tom over deep snow and take down one deer per week on average. What would have happened if I had thrown in the towel, back in September and called it quits? I guess I will never know…and that is fine by me. Wolverine defeats Mountain Lion. 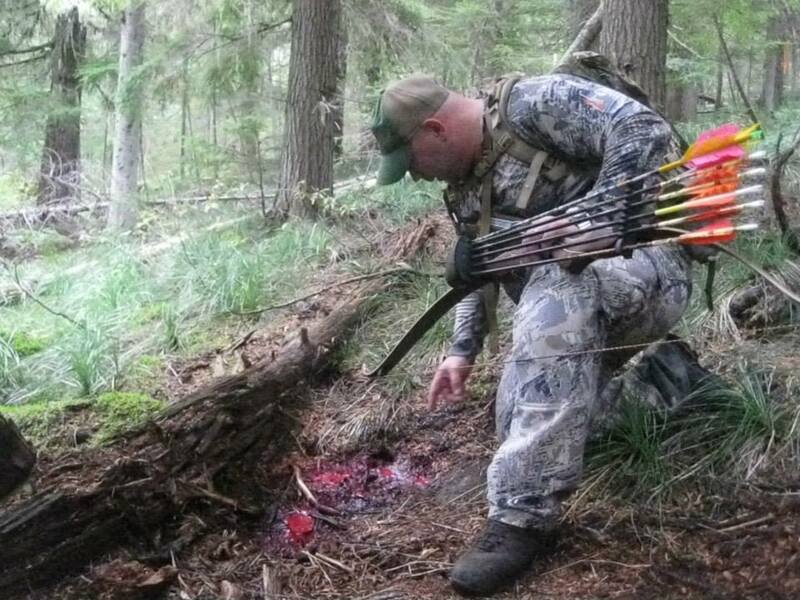 My 65# @ 27″ Wolverine FXT by Stalker Stickbows combined with a Grizzly Stik Momentum EFOC 330 shaft, tipped with a 150 grain Silver Flame XL broadhead worked together to yield almost an instant death. The 1.5″ cutting diameter of the 150 gr. 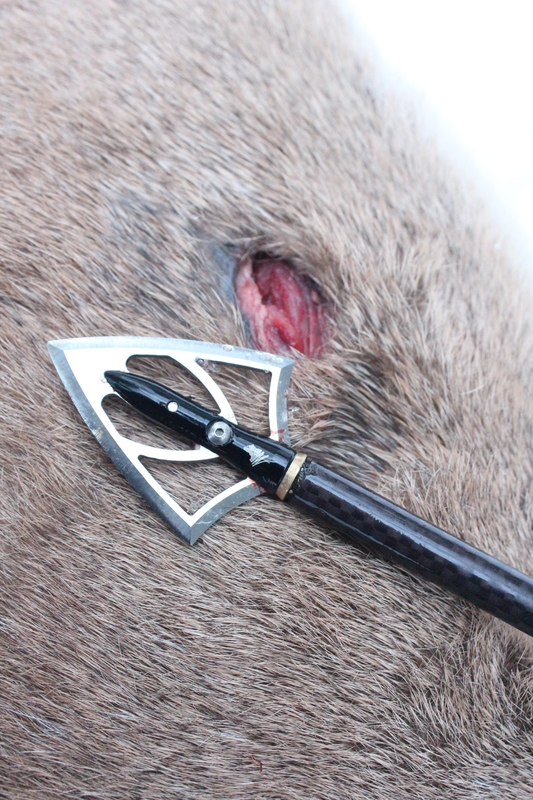 Silver Flame XL broadhead delivers wicked results on anything it is directed towards.